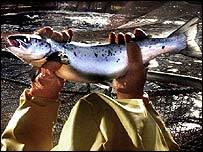 Trade barriers are set to be erected to protect the Scottish salmon industry from cheap imports. The European Union is to introduce a tariff regime from this weekend. It follows claims that Norway has been flooding European markets with cut-price salmon, leaving Scottish salmon farmers struggling. The British and Irish Governments complained to the EU and officials have now agreed to implement measures to safeguard the industry. A cap on the total volume of salmon imports to the EU will be put in place. Above that, a tariff of almost 18% is to be charged. The new regime will last for up to 200 days but experts said it could be extended. Scottish farmed salmon has also been awarded a new "protected" status which means only fish produced here can be labelled Scottish. The EU Salmon Producers Group, which represents the EU owned primary producers in Scotland and Ireland, welcomed the move. It has claimed that Norway salmon farmers were selling below cost price and were only kept afloat by massive government subsidies. Spokesman Angus Morgan said it was "excellent news for Scotland and the whole Scottish salmon farming industry". He stressed: "Over the past 18 months our industry, and that of Ireland, has been severely affected by massive over-supplies, imported at prices well below their costs of production. "Our industry has been blighted and in the past 12 months more than six companies in Scotland have gone into administration/receivership, the most recent within the past few weeks. "Many others are being forced to stop much needed investment and to reduce production."